How do you bring thousands of authors, publishing brands, imprints and marketing teams together into one website? 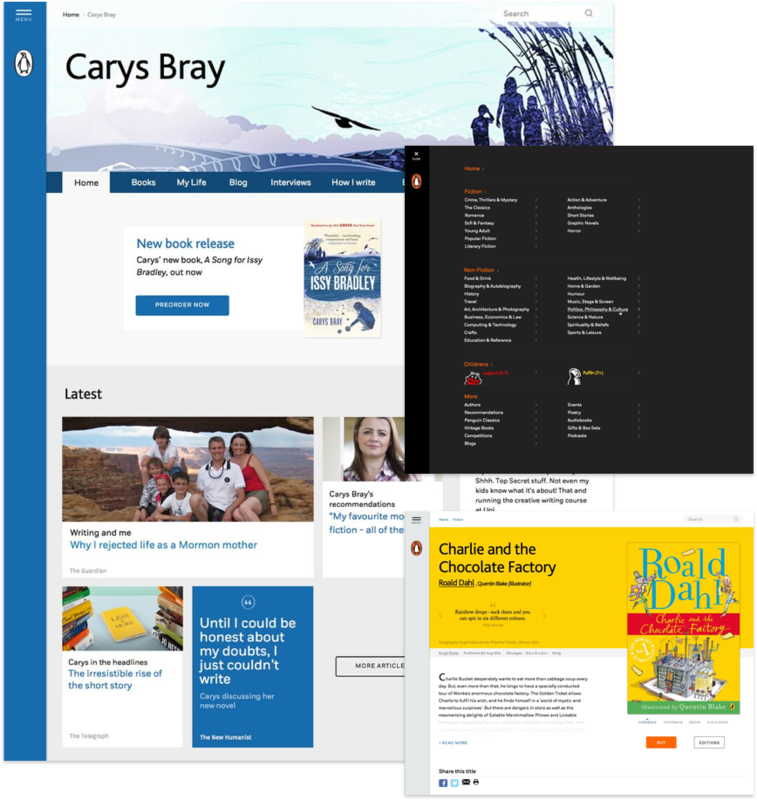 This is the story of how we led Penguin Random House through digital transformation. We’re in the news room, in the centre of all the activity, watching the team capture, edit, and share events from all over the world. It’s fast-moving, exciting, and iterative. In that moment, I realised that we could also design in a way that harnesses that same excitement. As formerly separate companies, Penguin and Random House each had their own websites. Then they merged. Collectively, the two brands managed over 700 other websites, distributed across 6 publishing houses and over 40 imprints. Each website individually focussed on authors, books, series, and characters. Few of those 700 sites had significant levels of traffic, and commissioning new sites and marketing micro-sites with external agencies was getting expensive. Penguin.co.uk was to become their new consumer-facing brand; it has 100% market recognition and the biggest catalogue in the world. Penguin Random House wanted to expand the brand beyond classics. People also don’t know that it’s related to two other strong brands, Puffin and Ladybird. How could we change the perception of Penguin and its related brands, and bring the brands together without diluting their identities? This brief became one of our biggest, most challenging projects. How do you create a single strategy for stakeholders who may also be competitors? I remember a really good sense of collaboration. There were a lot of moving parts—us at Clearleft, the team at Channel 4, but also the team at ITN. I think we had a really good working relationship between all of those people. Wikipedia rules the roost. When asked to find out what an author had written, people ignored the author’s own website (1st result on Google), then headed straight for the author’s Wikipedia entry (2nd). There is a seasonality to the purchase of books. 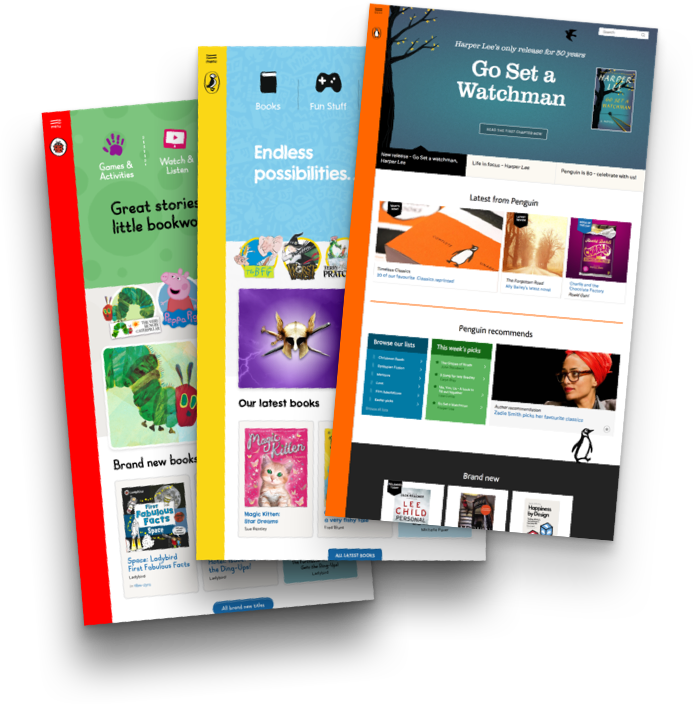 Most people didn’t find the idea of using penguin.co.uk to find books compelling. Yet, once there, they liked what they saw. We also saw an uptick in visitors using the site for this purpose at Christmas. How do you adapt the brand to digital, remaining faithful to the Penguin brand and sensitive to hundreds of sub-brands? When it came to the brand, we were pushing Penguin into unchartered waters, places the brand guidelines didn’t cover. The design language would be used to in places where the Penguin is secondary to another brand (e.g. Jamie Oliver, or Puffin). We agonised over the typography. Although there were brand guidelines, we didn’t feel they had a universal feel. Our choice of Bliss and Fort reflects this idea. We built throwaway HTML responsive prototypes, to see what our suggested design language looked like on a variety of devices. After much experimentation and testing with other brands, the result is the sidebar shown below. It gives some implicit consistency across the Penguin universe, while allowing other brands to express themselves. A user might unconsciously know that the brands were part of a universe, even if the colour and logo were different. "Traditionally, digital has been commissioned in silos across the organisation. By hiring Clearleft, we've gained a vision of how we should all work together."